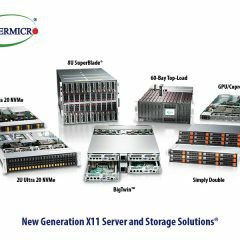 The Supermicro® BigTwin™ is a breakthrough multi-node server system Supporting The Full Range of CPUs, Maximum Memory and All-Flash NVMe. 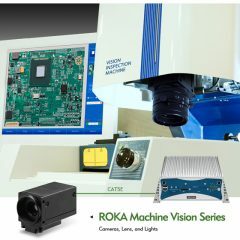 BigTwin™ supports maximum system performance and efficiency by delivering 30% better thermal capacity in a compact 2U form-factor enabling solutions with the highest performance processor, memory, storage and I/O. 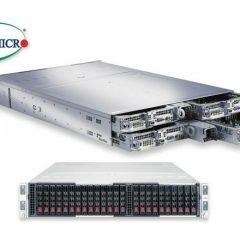 Continuing Supermicro’s NVMe leadership the BigTwin is the first All-Flash NVMe multi-node system. BigTwin doubles the I/O capacity with three PCI-e 3.0 x16 I/O options and provides added flexibility with more than 10 networking options including 1GbE, 10G, 25G, 100G, and InfiniBand with its industry leading SIOM modular interconnect. 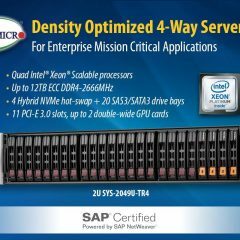 Each node can support current and next generation dual Intel Xeon processors with up to 3TB of memory, 24 drives of All-Flash NVMe, Hybrid NVMe/SATA/SAS, SSD and HDD, and two m.2 NVMe/SATA drives per node. Extending the industry’s largest portfolio of server and storage systems, the BigTwin is ideal for customers looking to create a simple to deploy and manage blazing fast high-density compute infrastructure. 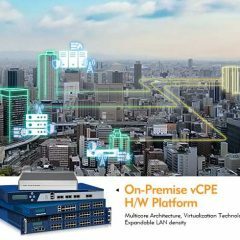 This new system is targeted for cloud, big data, enterprise, hyper-converged and IoT workloads that demand maximum performance, efficiency and flexibility. BigTwin optimizes multi-node server density with maximum performance per watt, per square foot and per dollar with support for free-air cooled data centers. 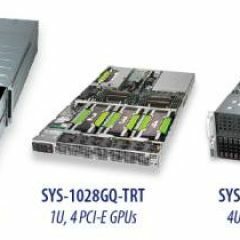 BigTwin is also the first and only multi-node system that supports up to 205-watt Xeon CPUs, a full 24 DIMMs of memory per node and 24 All-Flash NVMe drives ensuring that this architecture is optimized for today and future proofed for the next generation of technology advancements, including next generation Intel Skylake processors. BigTwin is a 2U server configuration that supports four compute nodes. 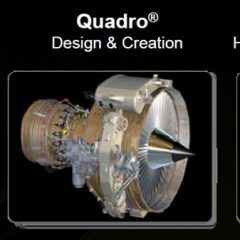 Each node supports all of the following: 24 DIMMs of ECC DDR4-2400MHz and higher for up to 3TB of memory; flexible networking with SIOM add-on cards with quad/dual 1GbE, quad/dual 10GbE/10G SFP+, dual 25G, 100G, FDR or EDR InfiniBand options; 24 hot-swap 2.5” NVMe / SAS3 / SATA3 drives; two PCI-E 3.0 x16 slots; M.2 and SATADOM; and dual Intel® Xeon® processor E5-2600 v4/v3 product families up to 145W; Supermicro’s PowerStick fully redundant high-efficiency power supplies (2200W, 2600W); and support for free-air cooled datacenters. 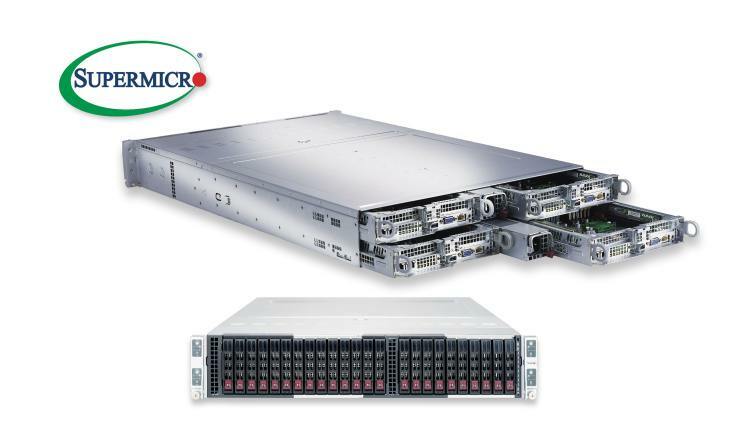 Sold as a complete system for highest product quality, delivery, and performance, the BigTwin is supported by Supermicro IPMI software and Global Services and is optimized for HPC, data center, cloud and enterprise environments.